This Bengali Bride Is Going Viral For Breaking Sterotypes And Being A Total Badass! Anything can happen at an Indian wedding. Instances like a bride cancelling her wedding because the groom failed a simple math test and the groom refusing to marry a bride addicted to WhatsApp convince us that there's no end to the level of 'strange' you can witness at a wedding. However, a desi bride has now taken the internet by storm and for all the right reasons. 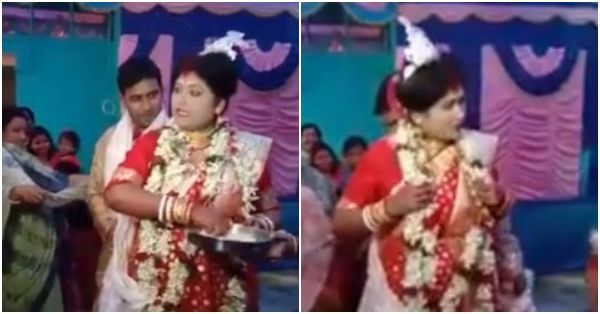 In a video that is doing the rounds on social media, the badass Bengali bride is breaking age-old norms that are a part of our outdated wedding traditions. The video shows the bride, in a red benarasi saree, refusing to cry during her vidaai. We also see the bride telling her mom that she will keep visiting her frequently because it will always be her house. The video starts with the bride's relatives asking her to perform kanakanjali- the bengali wedding ritual in which brides throw a handful of rice into their mother's saree. The ritual, that marks the farewell of brides from their parents' house, signifies that they have repaid all the debts to their parents. This bride, however, shunned the outdated ritual with a broad smile on her face and quipped, "You can never repay your parents' debts." Before leaving for her husband's house, she happily poses for the camera. You go, girl! We need more women like you in our country. The video that is already a hit on social media has been viewed over 3 million times and shared more than 68000 times since it was published on Monday. People are lauding the bride for shattering stereotypes and traditions that should've been long left behind.